Inside this adorable snowman shape is a nostalgic wintery world only Thomas Kinkade could bring to life! Christmas tree trimmers are hard at work putting on the final touches, while little dogs hang out to "help." In the background, a beautiful warmly lit mansion is surely full of merry guests. You can almost hear them dancing and caroling around the piano! 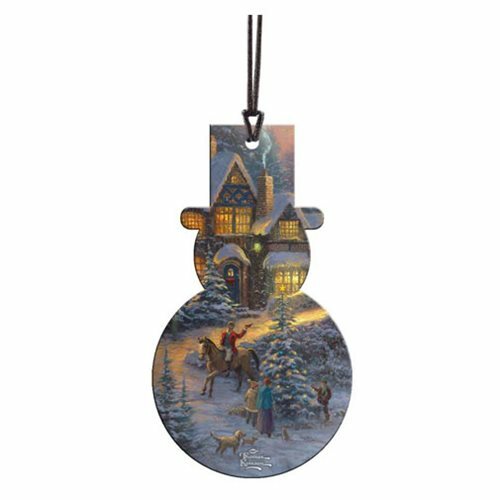 The art in this 3 7/8-inch tall x 2 1/5-inch wide Thomas Kinkade Spirit of Christmas Hanging Acrylic Print Ornament is fused directly and permanently into the acrylic for a light-catching image that's viewable from both sides. Hanging string included.